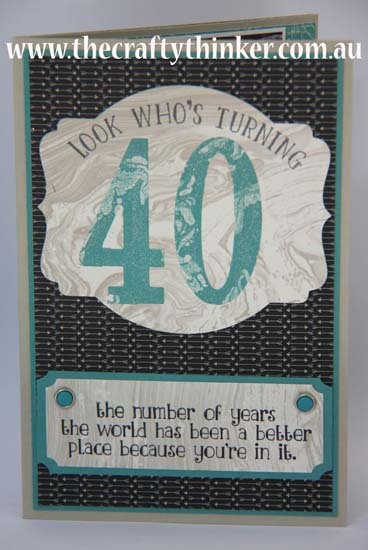 I wanted to make a special card to celebrate my nephew's 40th birthday (how can that even be possible?!!). so I turned to Number of Years and Going Places. 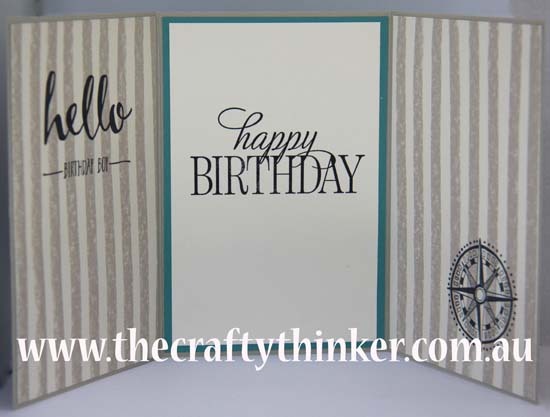 I cut Sahara Sand cardstock to 12" x 6" and then scored and folded the long side at 4" and 8" to create a triple flap card (perhaps it has a proper name?). The numbers and stamps are from the Number of Years bundle. 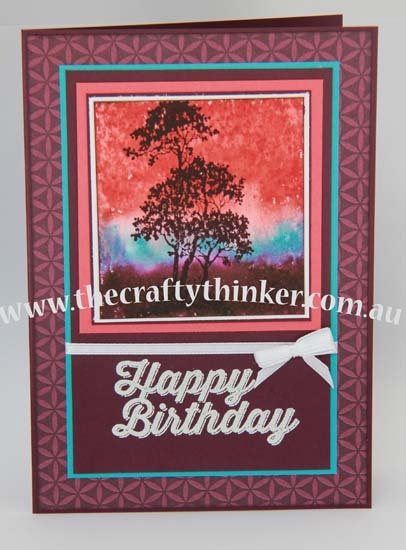 The front of card has the restrained, masculine look to it that I was looking for and it's mostly about the gorgeous Designer Series Paper - Going Places. No, my nephew isn't an alien! I distorted the photo since I haven't asked permission to show his image. As the card open, it gets more interesting. The photo I found of my nephew was taken on a boat, so the nautical papers in the DSP were a perfect match. 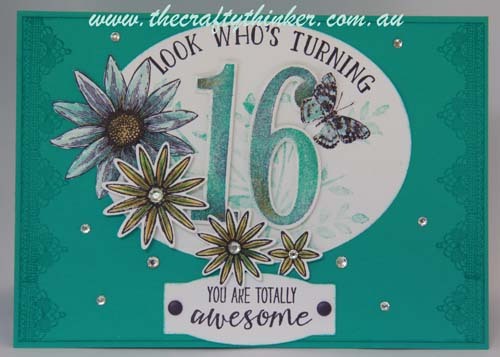 I was tempted to leave the side panels unstamped but eventually added "Hello birthday boy" from the Sale-A-Bration set Hello. 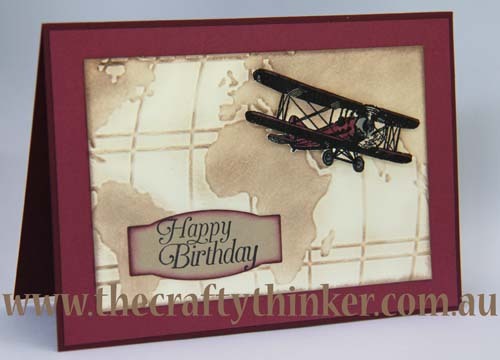 I balanced things out a bit with the compass design from the Going Global stamp set. 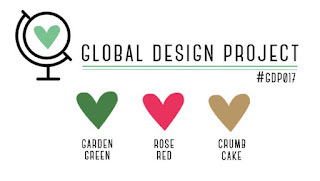 The colours are: Sahara Sand, Lost Lagoon and black. 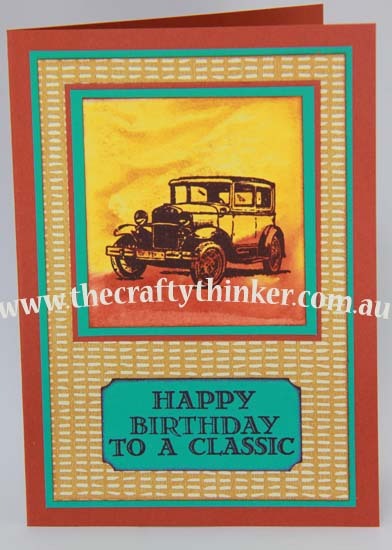 I think this card really flirts with being too busy but gets away with it! 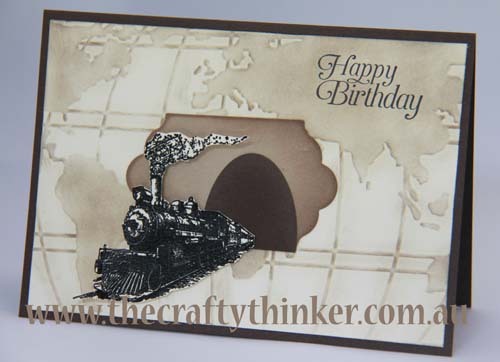 It's another side step card sample for class. I used the Whisper White Thick card for the side step card because of its strength. The flowers and leaves, cut with the Botanical Builder framelits, sit on a background of Everyday Chic Designer Series Paper. 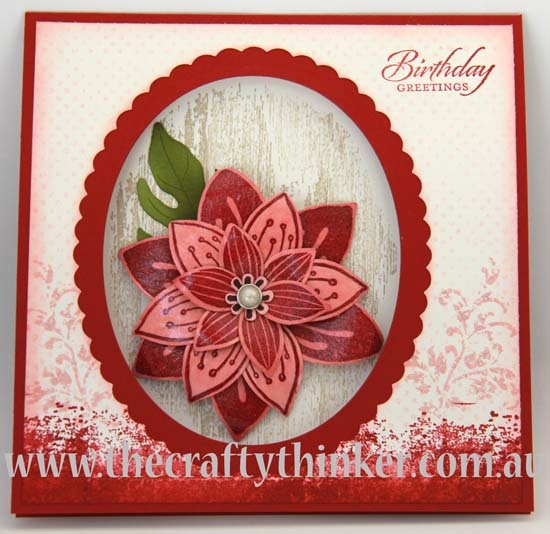 I think any bright colour would work for the flowers and leaves or using pastel colours would work well too. 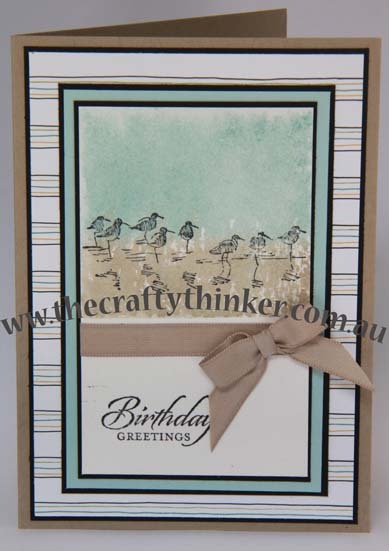 The birthday greeting is from Wetlands and is one of my favourites because it suits so many of my cards. I underlined it with one of the stamps in the Stamp a Bag set. I put a strip of white card underneath the Calypso Coral ribbon to show it at its best. The little banner uses a combination of the Banner punch and Bitty Banners framelits and is anchored with a Metal Rimmed Pearl. 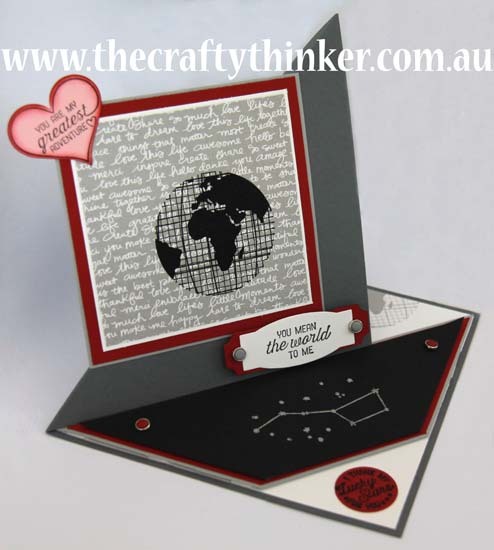 These are the dimensions I've been using for my latest batch of side step cards - originally based on the background size I wanted to use with the Bloomin' Heart thinlit for this card. Working along the long side, score between the cut and the closest edge - starting at the beginning of the cut at 2.5cm, then at 5cm, 8cm, 11cm and 16cm. 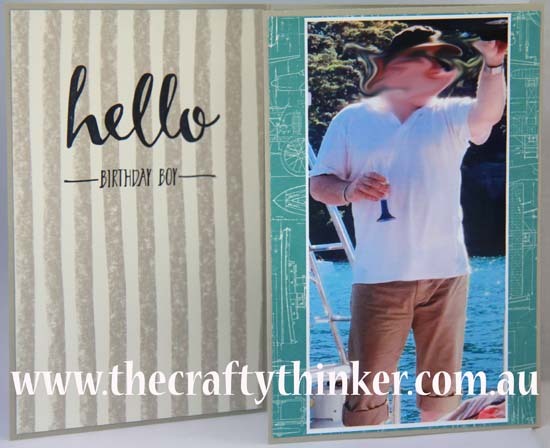 I love to create a special birthday card individually for each person but sometimes a birthday sneaks up on me and I need a card in a hurry! 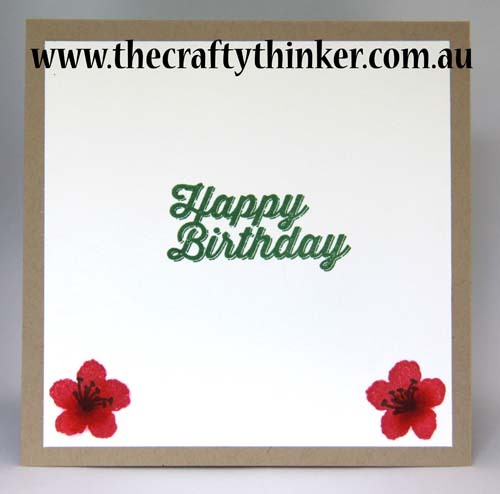 To be prepared for those occasions, I keep a little stash of cards to suit all occasions that I can dip into when necessary. This card is destined for the stash! I somehow ended up with 2 rolls of this Lost Lagoon ribbon - so I'm slowly using it up! 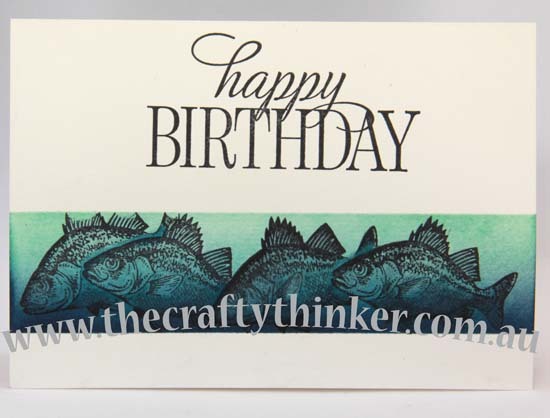 It's actually one of several side-step cards that I've created as a sample for class in a couple of weeks. 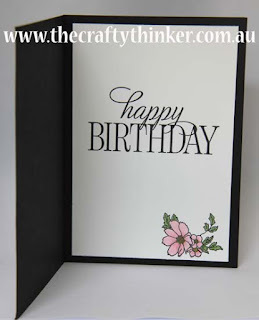 I'd be completely lost without my Stampin' Trimmer - especially when it comes to making fun fold cards! I used the Grateful Bunch bundle from the Occasions Catalogue and the FREE Sale-A-Bration Flowering Fields stamp set. The inks are Lost Lagoon and Blackberry Bliss and can you spot the gold Wink of Stella? Some Lost Lagoon ribbon and Basic Rhinestone jewels provide the finishing touches. 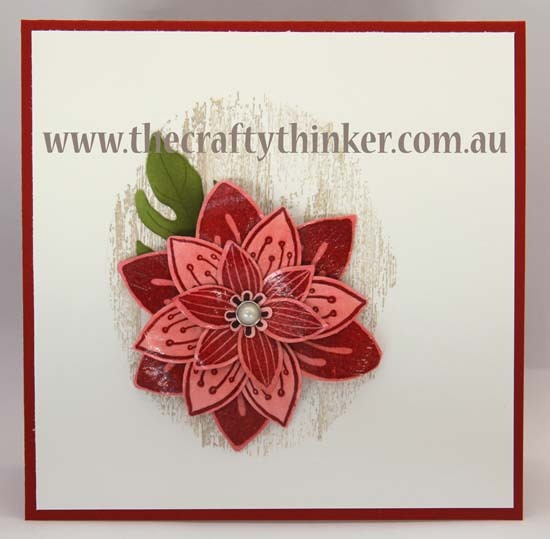 I hand cut the largest flower but the others are punched out with the matching Blossom Bunch Punch. 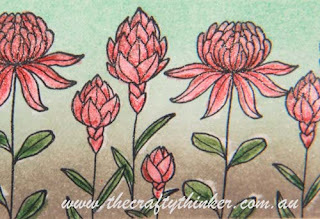 All the flowers and leaves were watercoloured with either Lost Lagoon or Blackberry Bliss ink. 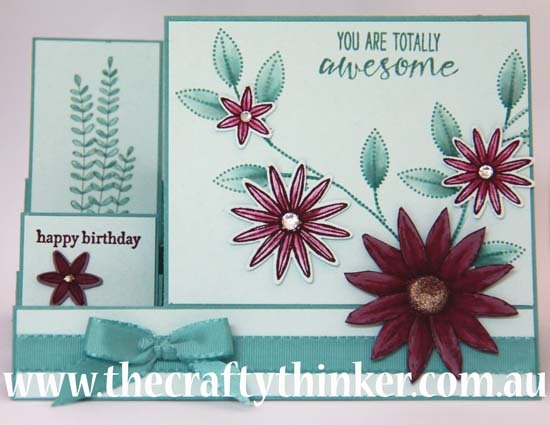 The birthday greeting is from the Teeny Tiny Sentiments stamp set. 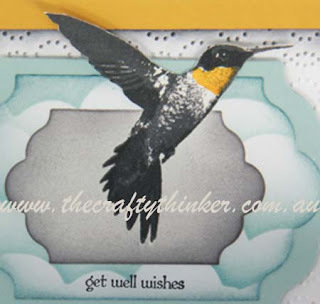 Side step cards are so easy to make and wonderfully versatile! One of the lovely ladies in my classes said she'd like to make a shaker card, so we'll be making one this semester. I've never considered myself to be a very "pink person" but something about these flowers whispered "pink" to me! I wanted the shaker to be a bit subtle and elegant, so I decided to use the Metallics Sequin Assortment .... which led me to using some black cardstock to go with the black sequins. The colours are Pink Pirouette (probably my least used colour! 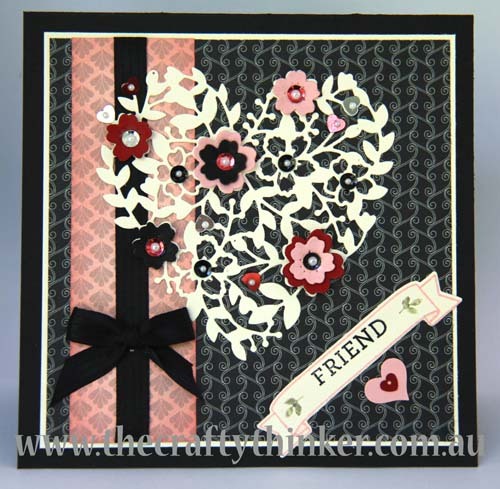 ), Basic Black, Whisper White and Pear Pizzazz (for the leaves). The flowers and leaves on the exterior are watercoloured, except for the centres of the flowers - that's gold Wink of Stella. The petals have a coat of clear Wink of Stella that you can't see in the photo - you'll just have to trust me when I say they have a lovely subtle shimmer! 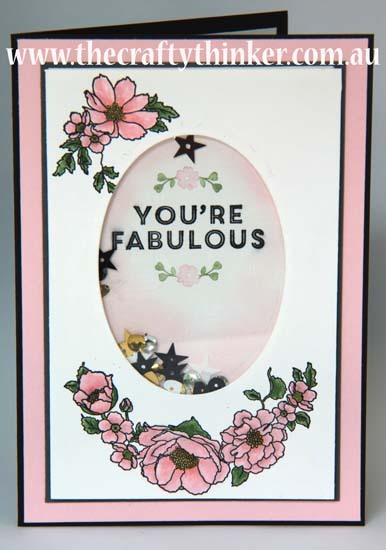 The You're Fabulous greeting (from the A Whole Lot of Lovely set) was inked up with my markers for stamping. 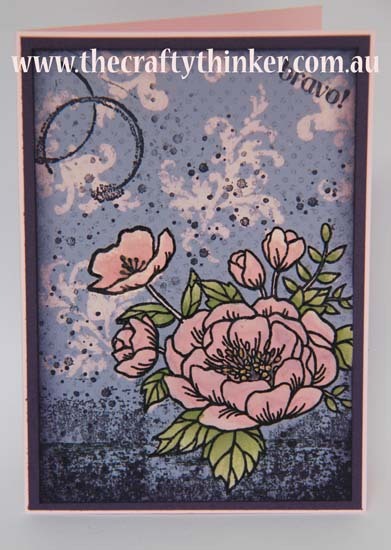 Then I surrounded it with a soft sponging of Pink Pirouette ink. 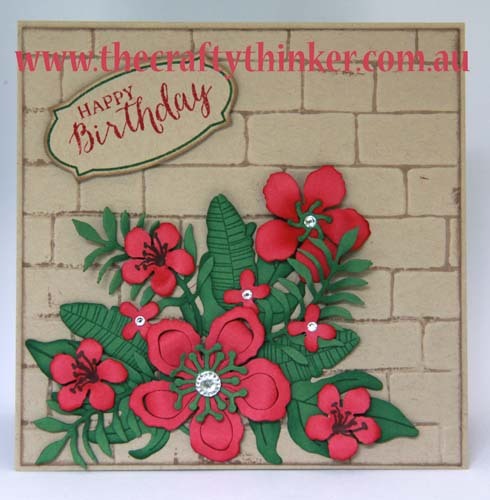 The fabulous greeting inside the card is from the Happy Birthday Everyone stamp set which, like A Whole Lot of Lovely, is an exclusive Hostess Set. So, if you like them, book yourself a party or workshop! (It can even be an online / virtual party!). 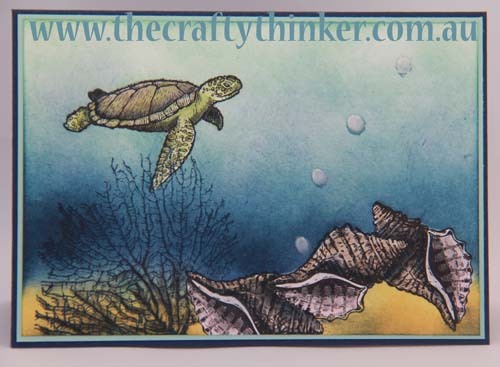 In my classes we'll be stamping a watercolour background with an acrylic block. This is one of the samples I've made for that class. One of the joys (and sometimes frustrations) of this technique is that it comes out different every time! I find it useful to have handy a tissue (to mop up excess ink/water) and a paintbrush that I can use to "help" the ink behave well. I also have a heat tool close by so that when I'm ready, I can quickly dry the piece and stop any further blending of the ink. It's great fun to try different inks and "loading patterns" and see what happens. To preserve the integrity of my ink pads, I prefer to add the ink from lightest to darkest. If I'm using 3 (or more) colours, I use a tissue to wipe away ink from the area where I want to add the next ink. 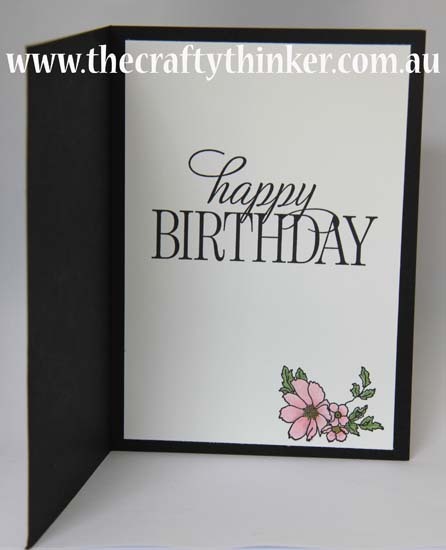 It's also worth testing different cardstock/papers to see which gives you the effect you want. I tried out watercolour paper, Whisper White cardstock and Shimmery White cardstock and found the Shimmery White was the one that I kept going back to this time. For more information about my classes - click here. 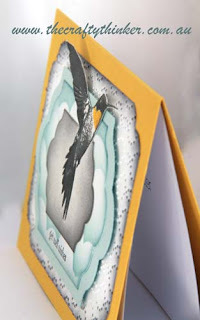 This side step card is the sample I have made for one of the classes in the 9-week course I'll be teaching in February/March. In addition to the side step fold, there is a little bit of paper piecing and a whole lot of embellishing! I'm so sad that I didn't have any Blushing Bride ribbon to go with the glimmer paper, so I had to make the most of what was in my stash - ah well - I know what my next purchase will be! I have lots of retired black glimmer paper left, so I decided to use some of it, otherwise I would have used Basic Black cardstock (which I think I would prefer in fact!). If you're interested in attending my classes - click here for details. Click on the images below to purchase any of the items. 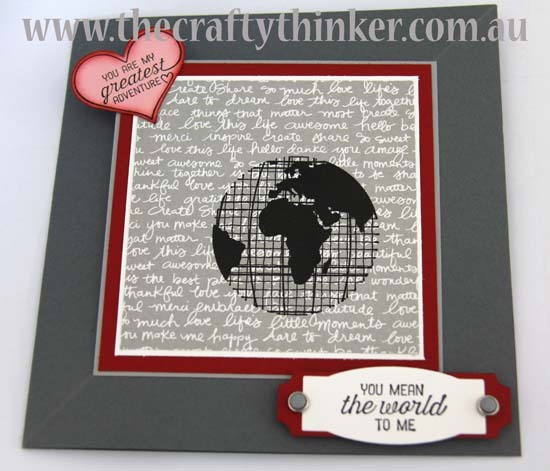 Welcome to the first Crazy Crafters Blog Hop for 2016! Happy New Year!! This month we are showcasing the Sale-A-Bration products that are available until 31st March. These products are FREE - you can choose one for every $90 you spend - how great is that?! 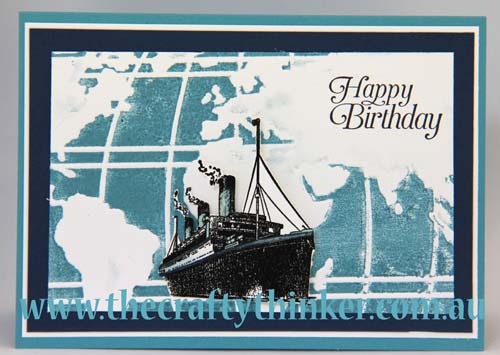 And there's a great selection of stamp sets and papers. Some of them are only available for a limited time so don't delay! 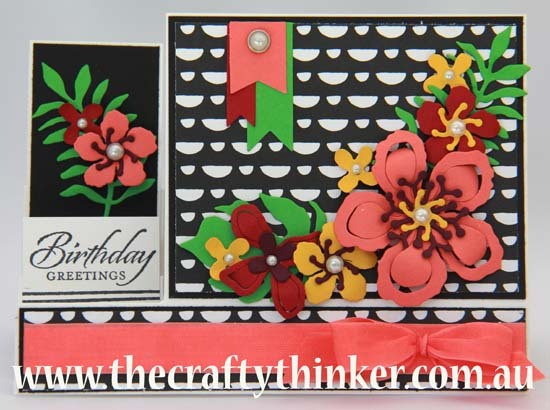 My card today features elements of the Flowering Fields (141303) and Hello (141243) stamp sets. 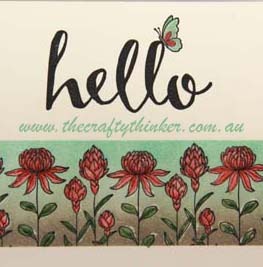 Each of these stamp sets have a great selection of stamps: there are 7 rubber stamps in the Flowering Fields set and the Hello set has a whopping 9! 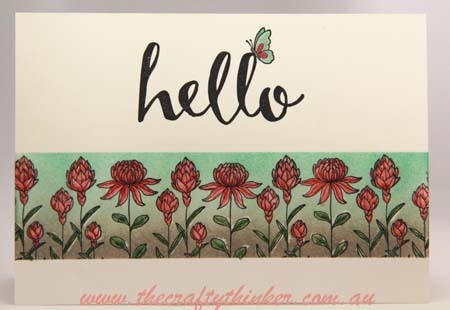 If you like the Hello set - don't delay - it's only available until 15 February. I used Shimmery White Cardstock (121717) because for a single layer card I like its weight and it's nice and easy to colour smoothly. 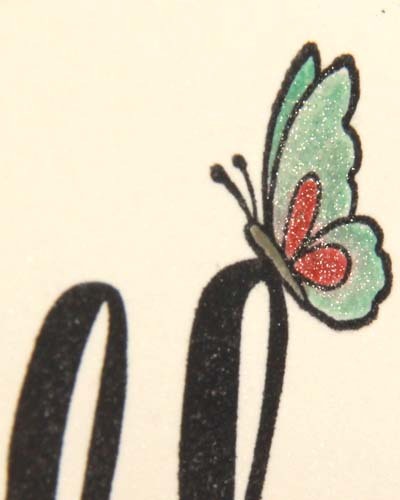 I decided that the butterfly from Flowering Fields could have a little rest on the word "Hello" and I added a bit of Wink of Stella so that it shimmers in the light. 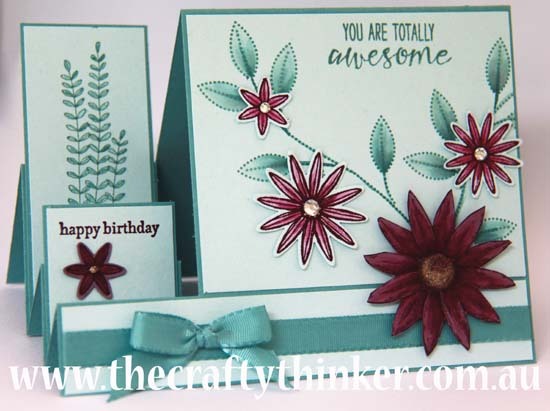 Sale-A-Bration is also a REALLY good time to join the team as a demonstrator if you'd like to get your hands on the great Stampin' Up! products at the discounted demonstrator prices or even build a business. Until 31st March you can build your own Starter Kit with a value of $295 for only $169!! Contact me if you'd like more information. And if you'd like an excuse to meet up with your friends - host a qualifying party until 31st March and earn an extra $40 to put towards the products you'd like to have. Contact me if you'd like more information. The bubbles have a shimmer to them. I'm busy preparing samples for the next semester of my classes at Learning in the Hills (commence Tuesday 2nd February!) and this is one of them. We'll be making this in class to learn about masking. For those interested: it's a 9 week structured course in Baulkham Hills, NSW. Contact me for more details or call Learning in the Hills to book your place on (02) 9639 7918. 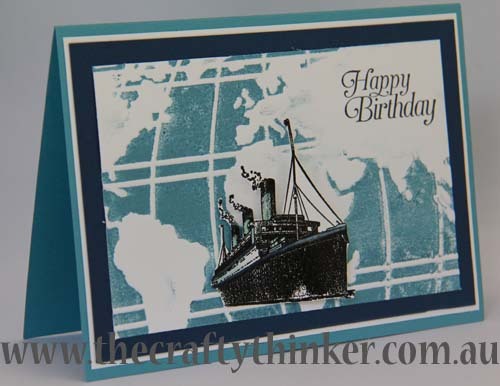 This card combines two stamp sets to create a little scene. I think the aircraft was being so noisy that everyone left the park bench! The lower half of the card uses two stamps from the Happy Home set which is in the new Occasions Catalogue. I omitted the clouds on the stamp with the park bench because they didn't fit with the rest of this particular scene. 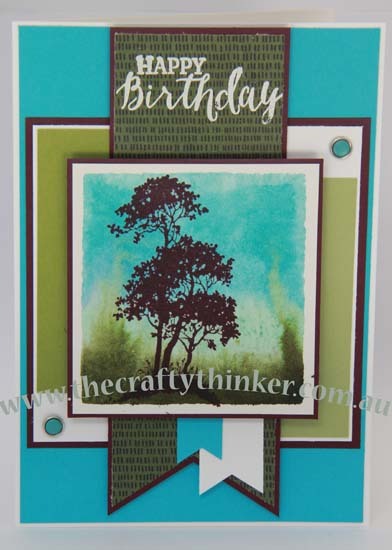 The top half used stamps from the Sale-A-Bration set called Sky Is The Limit. 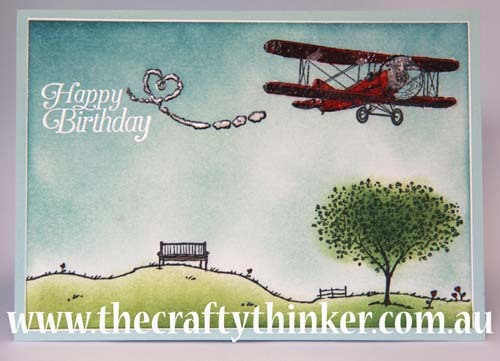 There are 8 stamps in the set including some great greetings and clouds. 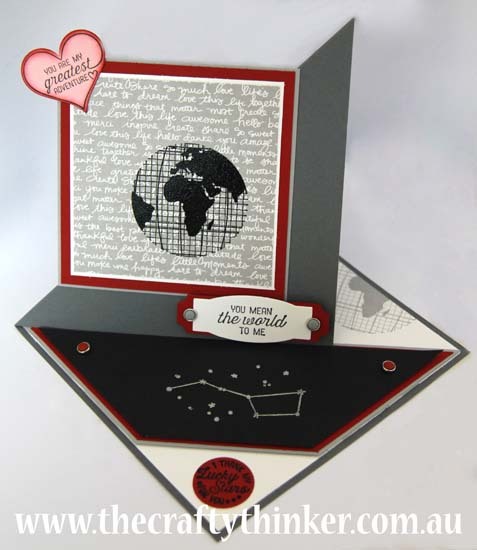 This stamp set is only available for a limited time (until 15th February or stock runs out) and can not be purchased. It can only be obtained FREE with an order of $90 of products. Applied Versamark to the aircraft and smoke trail heart using a Versamarker. Coloured the park bench with a Crumb Cake marker and the flowers with Real Red. 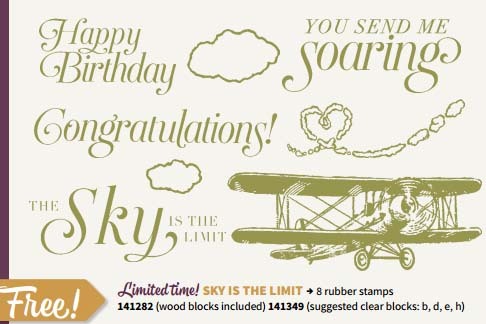 If you like the Sky Is The Limit stamp set (and it IS gorgeous and very versatile) - remember that it will only be available for a short while so get your qualifying order in as soon as you can! Hasn't time flown - tomorrow's the day that everyone can make their purchases from the gorgeous new Occasions Catalogue and earn FREE Sale-a-bration items at the same time! I'm a bit stuck on Crushed Curry and Wink of Stella at the moment - I don't seem to be able to keep away from them! 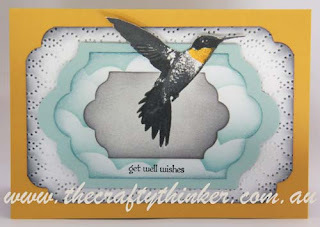 This card started out very differently and went through several different looks before ending up here! 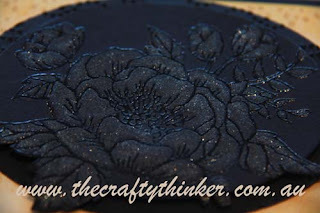 There are still things I wish I'd done differently ... and I will - on the next one I make! So hard to capture, but this card really shimmers in the light! I'm really in love with the beautiful shimmer from Wink of Stella - the only trouble I have with it is that it's REALLY hard to photograph! I added more Wink of Stella to the lighter areas of the flower. 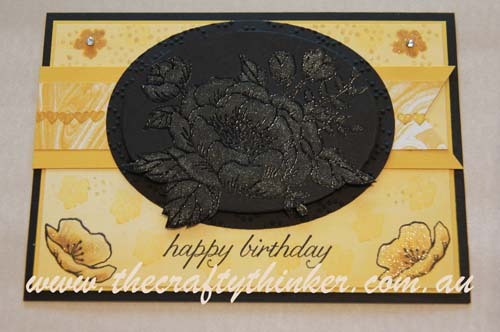 I clear heat-embossed the birthday bloom onto Basic Black cardstock and then bleached it. Once the bleach was good and dry, I applied a generous coating of clear Wink of Stella. 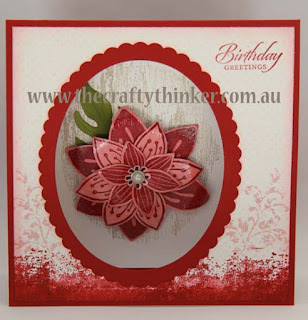 I used the Out of the Box technique to die cut the floral centrepiece with one of the Ovals Collection framelits. 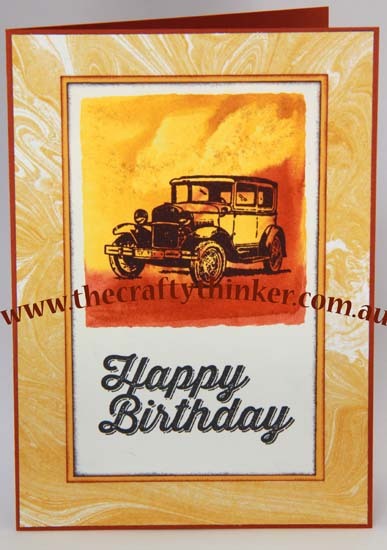 I used both sides of the yellow sheet in the Perfectly Artistic Designer Series Paper Pack (141021). This is a FREE Sale-a-bration item (with a $90 purchase) but is only available for a limited time. It's gorgeous, so don't delay! 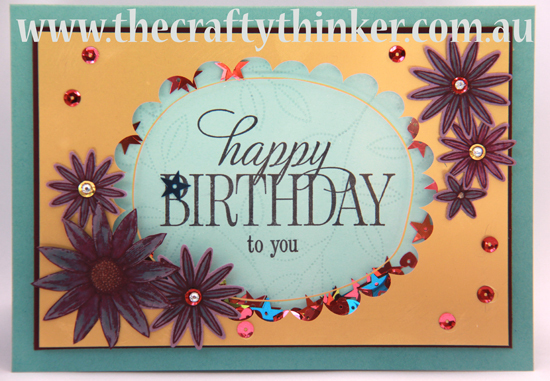 I stamped random(ish) dots using one of the stamps in the Birthday Blooms set. 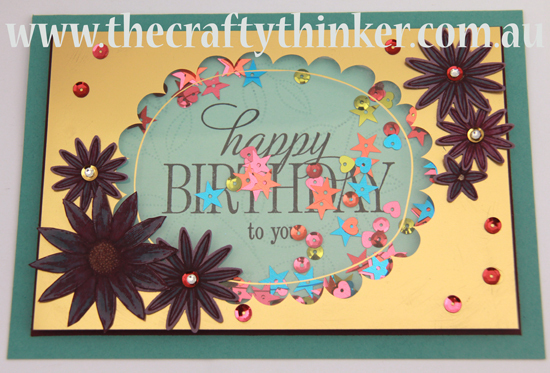 I did this by applying some gold Wink of Stella to the stamp, so the gold dots shimmer in the light. 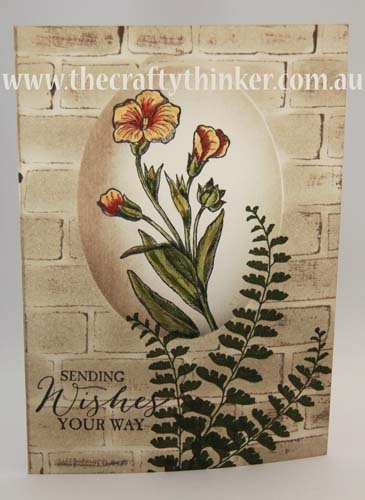 I painted the flowers in the lower corners of the card with Crushed Curry ink as well as some gold and clear Wink of Stella. 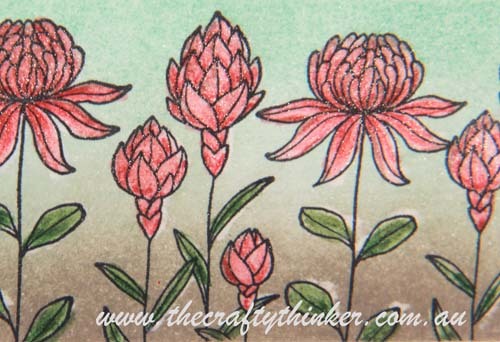 I also stamped some random little flowers onto the background with Crushed Curry ink that I'd stamped off twice. 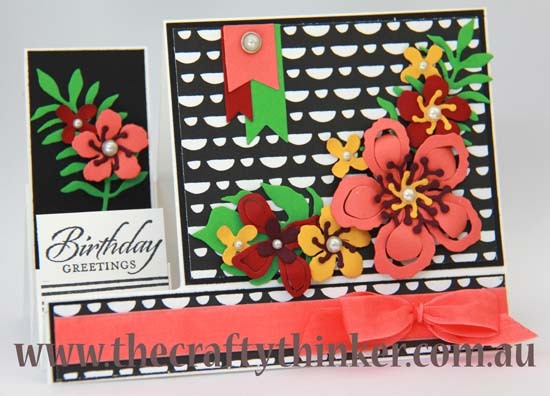 The greeting is from the Birthday Blossoms set.